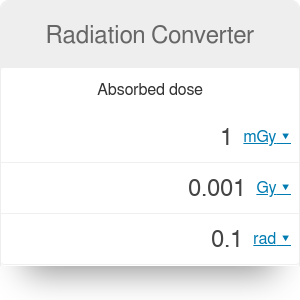 How to use radiation converter to change between radiation units? The absorbed dose measure is often used in radiation protection, dosimetry, and radiology. In other words, the effective dose shows the sensitivity of different tissues to radiation - for colon or lung the effective dose will be higher than for the equivalent dose for the brain or salivary glands. The units are the same as in equivalent dose, because we are multiplying that measure by the dimensionless weighting factor. Check which part of the converter you need. Let's assume you want to convert the effective dose, so choose the bottom part. Enter your given value into a proper box. For example, let's take the effective dose of a chest X-ray which is 0.1 mSv. The calculator displays the value in two other units. Now you know that 0.1 mSv is equal to 100 µSv and 0.01 rem. Remember that you can select different units from the drop-down list! Radiation Converter can be embedded on your website to enrich the content you wrote and make it easier for your visitors to understand your message.